The Crv2View command creates a curve from selected curves that are planar in different views. A third curve is created from two curves that are planar in different construction planes. The new curve looks the same as each of the original curves when viewed in each plane. This command works by extruding the curves and then finding the intersection between the two surfaces. If the command does not work for you, try using the Extrude command on the curves and checking to see how the intersection curve is created. Use Crv2View to create a curve when you know its profile in two directions. 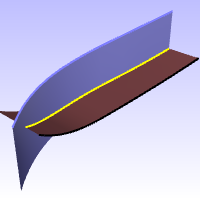 The example video demonstrates creating a curve that follows the edge of a boat hull from 2-D curves in the top and front views. The AlignProfiles command is useful for lining up curves in two views prior to creating a curve from two views.